A law firm's website should achieve good search engine visibility, attract new clients, and stimulate conversions. In order to achieve all of the above, a law firm's website must be updated on a regular basis with fresh, relevant content. However, legal websites are often static in nature because staff members have to request a web developer to update the site whenever they need to make changes. This leads to delays and added expenses. Implementing a content management system (CMS) is an effective way to keep your law firm's website up-to-date without the hassle. A CMS enables lawyers or staff to update a law firm's website anywhere and at any time with fresh articles, news, announcements, and more. A CMS is website management software and allows you to update your website's content quickly and easily, even if you have limited technical skills. The web-based interface of a CMS typically works very similarly to a word processor like Microsoft Word. From adding new pages, to deleting unwanted pages, to uploading images, to editing text, you can instantly update your website with a CMS. CMS's simplify the website management process, allowing attorneys to concentrate on running their practices. No one knows your law firm better than you do. A CMS gives you control of your website, so you have the ability to update its content and features according to your needs. Once you have a CMS in place, it becomes a lot easier for you to update your website. As a result, you're a lot more likely to add content to your site on a regular basis. And more content means greater search engine visibility and traffic. 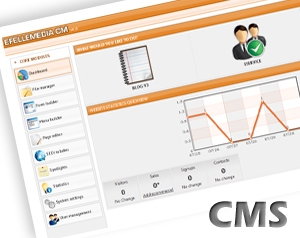 CMSs allow you to make changes in real-time. There's no need to wait around till your web developer gets around to making those changes you requested weeks ago. With a CMS, you can make adjustments as needed in order to improve your site's effectiveness. When you hire a professional web designer to craft your law firm's website with a built-in CMS, you get to enjoy the benefits of having a well designed website that enhances your law firm's brand image. Nevertheless, you still get to control your website's content and you're not dependent on a web developer to make changes for you. A CMS facilitates collaboration because it allows multiple staff members to log in and create, edit or approve content before it gets published. By creating different user accounts, you can even ensure that staff members are only able to update sections of the site that they're responsible for. In the long run, a CMS will save your law firm money because you won't have to pay someone to manage your website and update it manually. What's more, a CMS isn't expensive. In fact, all of the legal websites we build at efelle come equipped with our proprietary CMS, FusionCMS. efelle designs engaging websites for attorneys that include FusionCMS, a user-friendly website management tool that search engines love. FusionCMS is a web-based CMS that allows users with limited technical knowledge to manage a website's content from any Internet-enabled computer. Modules for FusionCMS include client web chat, a business blog, event scheduling, a form builder, and more. For more information about FusionCMS for legal websites, give our law firm web design experts a call at 206.384.4909 or fill out our online contact form.